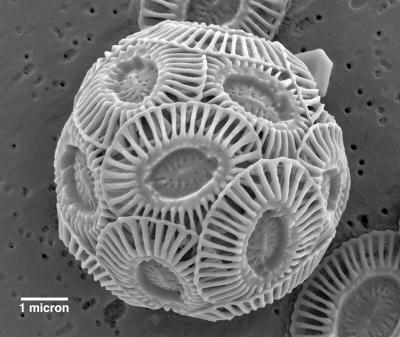 SAN FRANCISCO -- A year-long experiment on tiny ocean organisms called coccolithophores suggests that the single-celled algae may still be able to grow their calcified shells even as oceans grow warmer and more acidic in Earth's near future. The study stands in contrast to earlier studies suggesting that coccolithophores would fail to build strong shells in acidic waters. The world's oceans are expected to become more acidic as human activities pump increasing amounts of carbon dioxide into the Earth's atmosphere. But after the researchers raised one strain of the Emiliania huxleyi coccolithorphore for over 700 generations, which took about 12 months, under high temperature and acidified conditions that are expected for the oceans 100 years from now, the organisms had no trouble producing their plated shells.